Eileen Clarke has authored a number of wild game cookbooks, and in this tested recipe she shares some thoughts with Outdoor News on cuts of meat from big game our readers may have harvested. “If you’ve got chunks of meat that you’ve been avoiding because they are rather less desirable cuts, instead of paying someone to make them into sausage, try brining them. However, it is important to recognize that the brining process you may have used for a commercial turkey last Thanksgiving won’t be the same. Wild meat is more mature, with more ‘organized’ collagen and that means a piddly little 3-hour brine won’t get you anywhere. It also means brining for 4-5 days will instead transform tough/gamy meat tender and mild.” she said. Brine Ingredients & Directions – Start this process 48-72 hours ahead of when you want to enjoy your meal! Combine the water, salt, sugar, Worcestershire sauce and black pepper in a gallon-sized re-sealable bag. Seal and shake it, then add the roast. Refrigerate at least 2 to 3 days. *Herbes de Provence is a blend of spices: thyme, marjoram, rosemary, basil, fennel, sage and lavender. I wasn’t sure about the lavender at first, but it adds sweetness to the robust flavor of the rest of the herbs. Preheat the oven to 300⁰F. Arrange the oven rack so the Dutch oven will be in the center. Pour the brine off the roast, and dry it with paper towels. Set aside. In a 3-4 quart Dutch oven, heat the oil on medium to medium-high heat just until wisps of smoke come off the surface. Brown the roast on all sides, about 2-4 minutes per side, then remove it to a large plate. 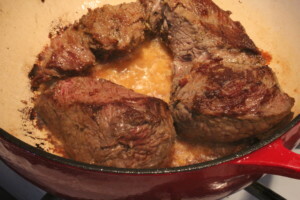 TIP FOR GETTING A RICH CARAMELIZATION ON THE MEAT: Dry the meat with paper towels before browning it: When you brown game meat, you want the meat’s surface to caramelize for richer, sweeter flavor. Leaving moisture on the meat leads to the dreaded gray foam in the pan—a result of steaming not caramelizing. Add the onion, rutabaga, potatoes and carrots to the pot, and let them simmer 4 to 5 minutes, to get some flavor. Return the roast to the pot, pouring the juices it left on the plate in, too. Add the rest of the ingredients. The liquid should come halfway up the pot roast. If it doesn’t, add enough more chicken broth until it does. 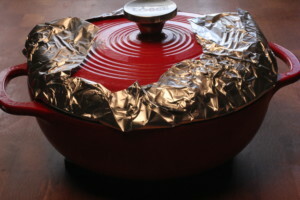 Let the pot come back to a low boil, lay a piece of foil over the top, then put the lid on and transfer it to the oven. Cook for about 3 hours, turning the roast 2 or 3 times. When done, you should be able to easily poke it with a knife. Spoon a dollop of honey mustard on each serving and dig in. COOKING HINT: Lay a piece of foil inside the lid to contain moisture. That’s an enameled cast iron Dutch oven, and the lid weighs over 3 pounds. Yet, put it in the oven at 300⁰F and moisture escapes. 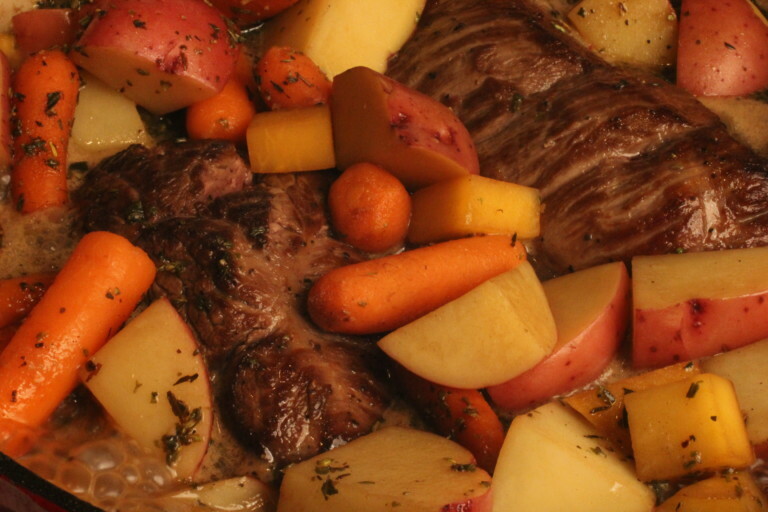 Depending on your pot, and how long you cook your pot roast, you may lose enough moisture that your pot roast ends up dry. The foil makes a measurable difference, even with a 3-pound lid.